With Thanksgiving Day tomorrow, it felt right to ask this question. And it feels right to answer it myself first. First and foremost, it’s God’s love and grace. What better gift can we hope for? God loves us even when we make mistakes and don’t particularly love ourselves (I’m guilty of that sometimes). One of the things I’m grateful for is you, our readers. Every letter, review, word of support, simply the knowledge that you read our books means so much to us. I’m grateful for releasing my first single-author Christian contemporary romance set, In Love by Christmas. Yes, I know it’s only Thanksgiving, but I believe it’s never too early to think about Christmas. Sweet, faith-filled, wholesome Christian romances to warm your heart! 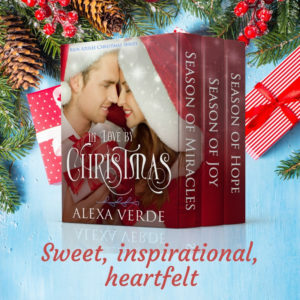 Three full-length Christmas novels about faith, love, and second chances, together for the first time in this collection. Let a book trip to Rios Azules, a small town in south Texas with quirky residents and caring community, bring you joy and put a smile on your face! Join three unlikely couples as they let God work miracles in their lives and find love, hope, and future together. In honor of Thanksgiving and to give thanks to our readers, Autumn Macarthur, Marion Ueckermann, and yours truly decided to offer a Tri-author Thanksgiving Paperback Giveaway at Fiction Full of Faith blog. Many thanks to Paula for hosting it! (Please note that only comments on this blog post at the Fiction Full of Faith blog count as entries for a chance to win featured paperbacks). 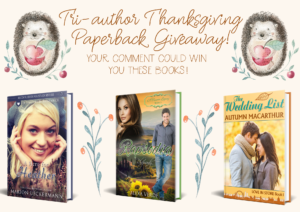 Tri-author Thanksgiving Paperbacks Giveaway is open to entrants in the U.S. only. If the winner is international, they’ll receive ebooks. We’d love it if you could stop by the blog post! Giveaway! One randomly chosen commenter to this post will receive ebook In Love By Christmas (to be gifted via BookFunnel). The giveaway is open until 6 p.m. CST November 26th. What are you thankful for? I look forward to reading your comments! Hi Alexa! Looking forward to reading your boxed set In Love by Christmas. Downloaded and ready to go. Thankful for my hardworking sons and daughter-in-laws, for my two grandsons, two granddaughters, for a comfortable home, plenty of food, on my table, health to get around and I gerächt with others, availability of so much great reading material, and the means to enjoy life and travel. God is good. Best wishes and Happy Thanksgiving. Awwww, Renate, thank you so much for downloading my Christmas set. I hope you’ll enjoy reading it. I loved your list of all you’re grateful for. And I’m definitely thankful for your continued support. Thank you for your good wishes, and Happy Thanksgiving to you and your family! I am thankful for my husband and two boys, for our extended family and for amazing friends who have become like family to us. I am thankful for work- for a job where I can share who Christ is to my students, for a home and peace. I pray that I never take for granted the many blessings God has given. Hello, Wemble! What a wonderful and beautiful prayer! Thank you so much for sharing about things you’re grateful for. And yes, I’m excited to have a set of my own books! Well, the books in the set were published as solos before, but they are together for the first time in this collection. Happy Thanksgiving to you and yours! I am thankful for me. You see, I was born on Thanksgiving Day. Tomorrow, we celebrate my birthday and a day to be thankful for all that God has given to us. Also, I’m thankful, that I don’t have to cook. Wow, Janet! Happy Birthday tomorrow! Wishing you lots of love and happiness! That’s a great list! Thank you so much for sharing. And a more expanded list of mine is also on Paula’s blog. :) It was fun writing it! I am so grateful this year, and this group is a large part of it! I have made so many connections and lasting friendships here, you all make me smile daily! I adore you all!! I am grateful for the time I get to spend with loved ones. That is such a wonderful thing to be grateful for. Thank you for sharing, Sonnetta! Happy Thanksgiving to you and your family! Happy Thanksgiving, everyone! Hoping if you celebrate it, that the day is bountifully blessed. What a beautiful wish! Thank you! Congratulations my dear friend on new release!!! So happy for you! I’m so thankful for God keeping us safe, for His Love and for His Son!!! Thank you so much, Natalya! And Happy Thanksgiving to you and yours! 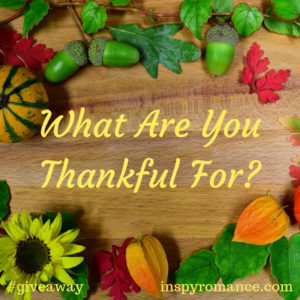 I’m thankful for family, food, a warm house, a new church family after moving, and Christian romance authors! Thank you so much for sharing, Diana! I have so much to be thankful for. Salvation, family, a roof that doesn’t leak, a warm house in the winter and cool house in the summer, our church, books, writing, pets, coffee, computers. The list goes on. I loved your list, Shannon! Thank you so much for sharing!